Facility is closed all major holidays, including Christmas Day and New Years Day. 736 spaces (720 regular and 16 handicap) in the parking garage. Clearance height 6’9”. 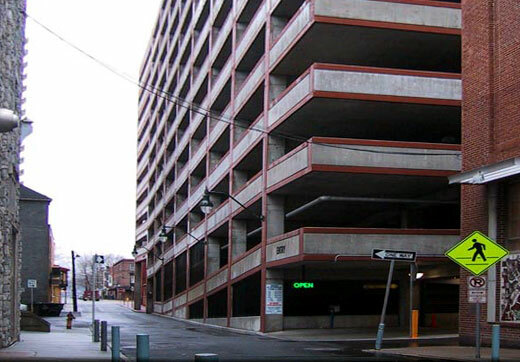 Monthly parking customers may enter or exit the garage at anytime 24 hours a day, 7 days a week. Daily parking customers must enter on Monday through Friday between the hours of 5 AM – 7 PM, and may exit at anytime with a ticket. Please note that you must have your ticket with you to open the garage pedestrian doors after hours. If you need assistance there is an intercom at the door which is answered 24/7. Cash and all major credit cards​ accepted. Lost tickets will pay the 24 hour rate for each day parked.